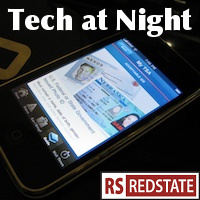 Late start tonight for Tech at Night. Sorry, but I’ve started a plan to get myself out of California, and to be honest I’m more than a bit nervous about the whole thing. Looking for new work in the Obama economy? Yeah. But at least Marsha Blackburn wants to help the tech job situation by taking on Barack Obama’s twin regulatory nightmares of the FCC and the FTC. The EPA isn’t so hot, either. Seton Motley is still plugging away against Net Neutrality, too, referencing Phil Kerpen’s new book: Democracy Denied on the Obama regulatory scheme to bypass the Congress when implementing radical ideas. Industry continues to rush to the FCC with its hand out in the wake of the FCC’s officially launching the Universal Service Fund reform effort. What will be the next Solyndra, hiding among all of these subsidies, I wonder? Even as Wireless competition is highlighted by C Spire’s nabbing of the iPhone 4S, Grilling of T-Mobile continues at the behest of Sprint Nextel and Soros-funded ally Public Knowledge. iPhone is good for business. T-Mobile doesn’t have it. It’s not hard to see the problem, here, and why competition is helped, not hindered, by T-Mobile joining up with another 4G-deprived firm. Seriously, you’d think from the way the radicals talk, that Sprint Nextel’s a bunch of helpless little kittens, and not another big telecom firm made up of its own history of merging. PATENT WARS: Apple fails to gain ground on Samsung in the US the way the firm has abroad. I’ve done a lot of complaining around here about former Energy and Commerce ranking member Joe Barton, and subcommittee head Mary Bono-Mack. I think they sometimes try too hard to get government involved in things that are perceived as problems, and I wish they’d heed Calvin Coolidge’s words on problems coming down the road. But online poker legalization isn’t a bad thing in my view. I wish we’d get the feds out of gambling at all, and return it to the states, so I would tend to criticize these efforts for not going far enough. So much of our national anti-gambling law is set up as an effective subsidy for MLB, NFL, and the NCAA, giving legal weight to the leagues’ desires to create an attractive product. Why else would we have specific laws against betting on sports? But if we have to start with poker, then let’s start with poker. PROTECT IP, the national Internet censorship blacklist bill pushed by some Senate Demcorats, but defiantly held by Senate Democrat Ron Wyden, has picked up another ally in the AFL-CIO. I know some on the right have been inclined to support this power grab, which would threaten America’s Internet leadership worldwide, because in theory it’s there to support property rights. But in practice, having the government censor websites by hijacking DNS via government-mandated blacklists doesn’t actually do anything to stop copyright infringement. In fact it hinders both free speech and property rights.